This post contains affiliate links for your reference. If you choose to shop through these links, you have our heartfelt thanks for supporting the blog! 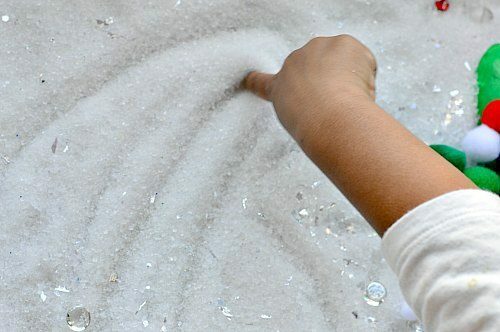 Be sure to see our yesterday’s post on a simple winter sensory bin where we introduced the fun we had with just Epsom salt and pretend snow flakes. Following along the same lines, we used the sensory bin to do practice some letters writing. The 3 year old did some wonderful pre-writing in the sparkly pretend snow. 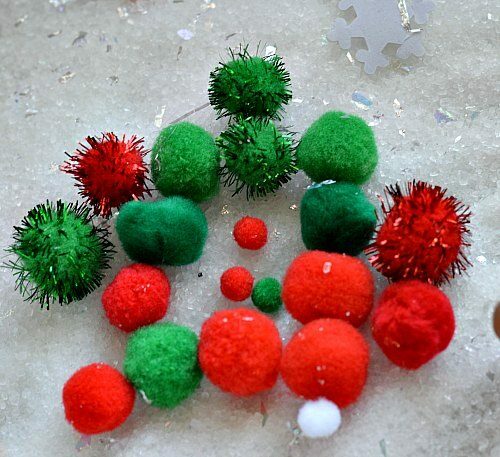 She can now write the letter “A” and she was eager to write that and trace the letter with the brightly colored pom poms. 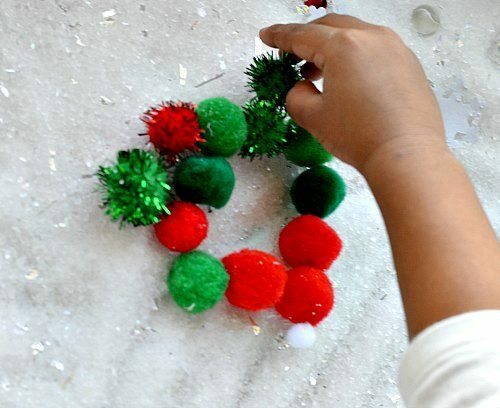 It was a wonderful fine motor exercise and a good opportunity to talk about patterns. 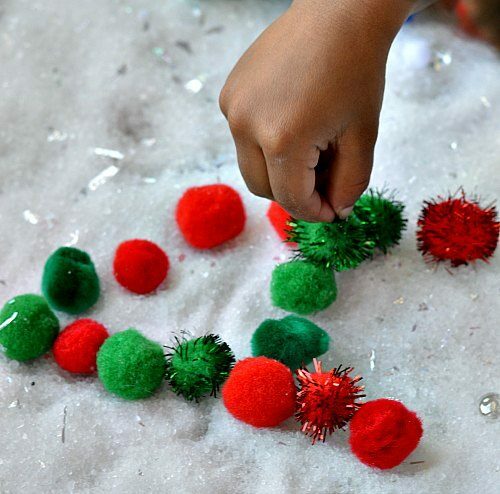 Once she carefully arranged her pom poms on the letter, she stood back and clapped her hands in pure joy. It was fun to watch it. Well, the letter writing kick did not last lost and she wanted to make her own designs. Of course, we are all about child-led play here. 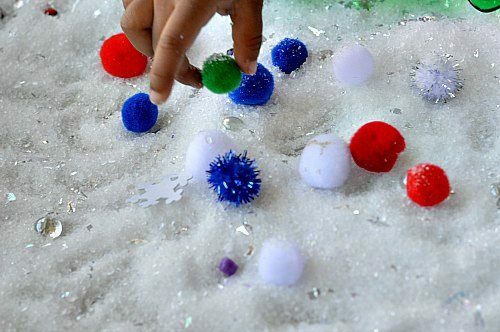 A great fine motor workout resulted in a beautiful pattern on our pretend sparkly snow. Pattern making turned in even more involved play time. When big sister joined in it resulted in a super fun role play in a small tub of pretend snow. That’s for tomorrow. 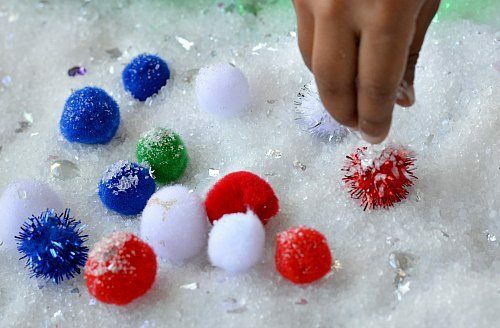 Thanks for reading and get yourself some Epsom salt for a wide variety of sensory play this winter. Note: Although on that particular she did not engage in pre-writing a whole lot, she did come back and wrote in that sensory bin plenty of times during the day. 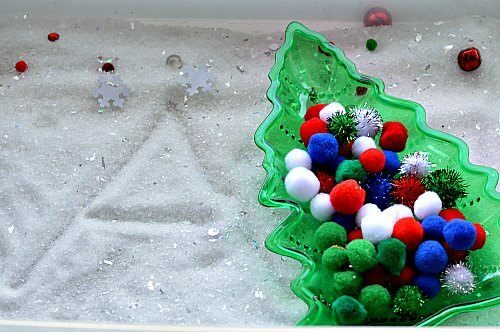 I kept the pretend snow in a covered plastic bin and would catch her playing in it all the time. 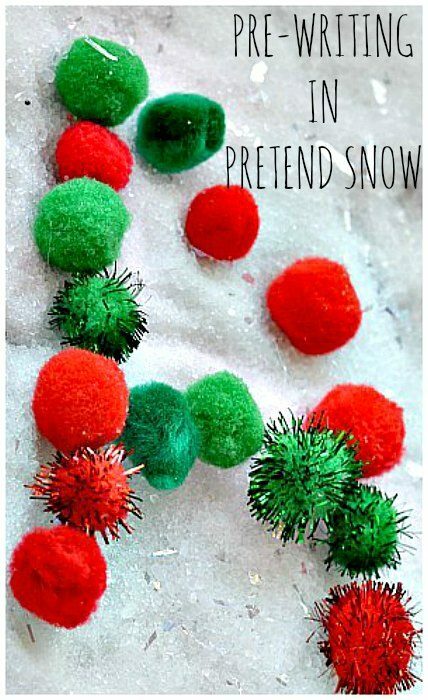 Be sure to keep it in a place where you can watch them , preferably in the kitchen since I don’t trust the 3 year old alone with this kind of sensory material – unless I want my living room to be turned into a pretend snow winter wonderland.